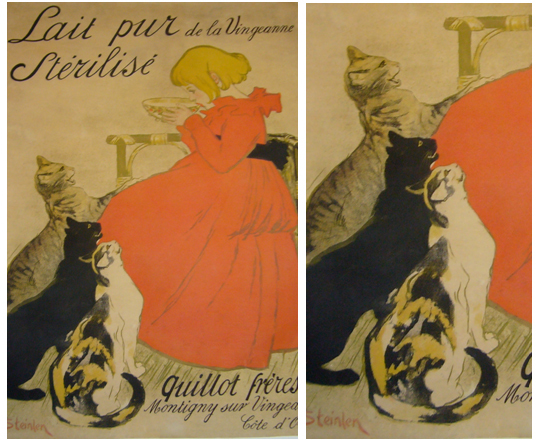 Steinlen, Cats, Mice, Red Wine and Poster Restoration…. On occasion I will buy a poster that is in less-than-excellent condition, or a client will bring in a poster that needs professional love and care (read: restoration). 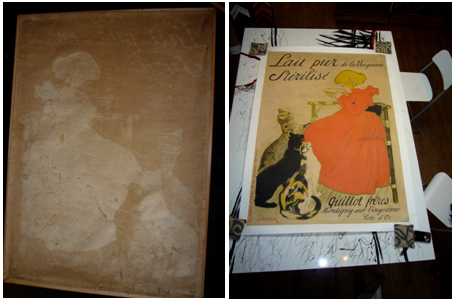 I realized, when I opened L’Affichiste, that professional restorers and linen backers, are hard to find. I think that’s because poster restoration is a painstaking, time-consuming, detailed (almost lost) art form that only crazy people would undertake (here’s a video of a crazy person, I mean poster restorer, at work ). I mean really, in our Internet-driven, fast-paced world, can you really imagine harvesting old paper scraps in the event that they might be needed for a months-long restoration project that might come your way?? A little history: “The backing of posters with fabric dates back to 19th century France, where posters were occasionally glued to linen for reinforcement. This provided some protection, but with the passage of time the paper continued to become brittle and was frequently torn by stress. Modern backing techniques have eliminated this problem by using an acid free paper between the poster and the fabric. The adhesive used is wheat paste treated to inhibit mold growth. The principal reason to fabric-back a poster is to provide support for the paper. It also enables the conservator to flatten the folds and to more easily make repairs. Fabric backing also eliminates the waviness that can occur when the poster is framed. I’ve actually never had the stomach to watch one of my babies during the restoration process, but there are some very detailed videos that show the process step-by-step, http://www.youtube.com/watch?v=KEWKu_d7oUI, http://www.youtube.com/watch?v=MKBfUxuNoA0, http://www.youtube.com/watch?v=CB7me-4a6WY. Shortly after I opened the gallery about 4 years ago, a new client rang the bell. As I waited for him to climb the stairs, I noticed his height, his elegant and well tailored cashmere coat, and the ease with which he carried himself. A man who appeared to be in his sixties, with a full head of grey hair and a formal demeanor, made his way up and slowly bent down to take off his galoshes. As he straightened up, he put his hand out, introduced himself and asked if I was the owner of the gallery. When I indicated that I was, he asked if he could come in and talk about posters and my knowledge of them. Up until that point, when folks would wander into the gallery, more often than not, it was curiosity that had driven them in, but with this man, it was clear that L’Affichiste had actually been his destination. A few months later, his wife and her sister-in-law appeared at the gallery together – each one carrying a large poster in a thin frame. Neither poster had ever been covered by glass, and both were in very serious states of disrepair. Water damage, harsh weather (the cabin was not weather proofed), mouse nibbles, cracked ink and stained and missing parts of the images – if you were looking for posters which showed every possible sign of neglect and disrepair, these were excellent examples. They had been nailed to their flimsy frames with ancient thumb-tacks, they had been trimmed inexpertly, they were cracked and torn … in short, these were literally shadows of the posters which had been brought back from Paris a hundred years previously. 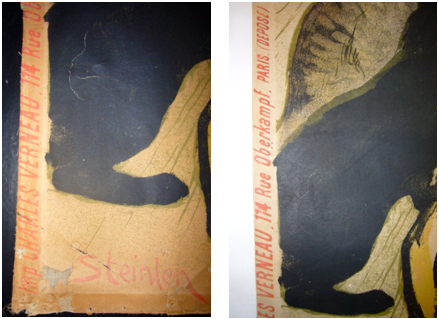 But underneath all the grime and dust I could clearly see that both posters were signed in the stone by Steinlen – one was an iconic image of Steinlen’s daughter Colette and her favorite cat, both were printed by Steinlen’s official printer of choice, and each was undeniably the real thing. It took two restorers more than a year to bring Colette back to life. When she returned to me, she looked much as she had when she originally came off the press: clean, pure, and very much as Steinlen had designed her more than a century before. Both my clients and I were very pleased with the results. The backside of the poster ‘before’, and the restored poster just before it was framed. Some months later my dapper French Canadian lawyer client returned with another poster rolled under his arm. When I unwrapped it I recognized a Cheret – well, more precisely, as a piece of a Cheret. The poster my client presented me with was a variation of a poster Cheret produced for a company called Saxoleine – producers of lamps and lights in Belle Epoque Paris. Although Cheret is not one of my favorite artists, I was familiar enough with his work to recognize that this fragment was roughly one quarter of its original size, and it too was in sorry shape. I suggested that it would be less expensive to buy an original, full size Cheret poster of the same theme – possibly even the same image- than it would be to reconstruct this poster as we had the Steinlen. But this time the client needed no time to think. He wanted the work done – it didn’t matter how long it took or how much it cost.